I work for town of parish highway Dept…I’m tier 5 .. what would the difference be between retirement at 59 with 20 years and 62 with 23 years service credits?? That depends on your earnings, and unfortunately, the NYSLRS Social Media team does not have access to your personal account information. Assuming you’re in the Employees’ Retirement System, you can find your pension calculation information in the Service Retirement Benefit section of your Tier 5 retirement plan book. At age 59, you would have an 18.33 percent reduction. At age 62 you would have no reduction. 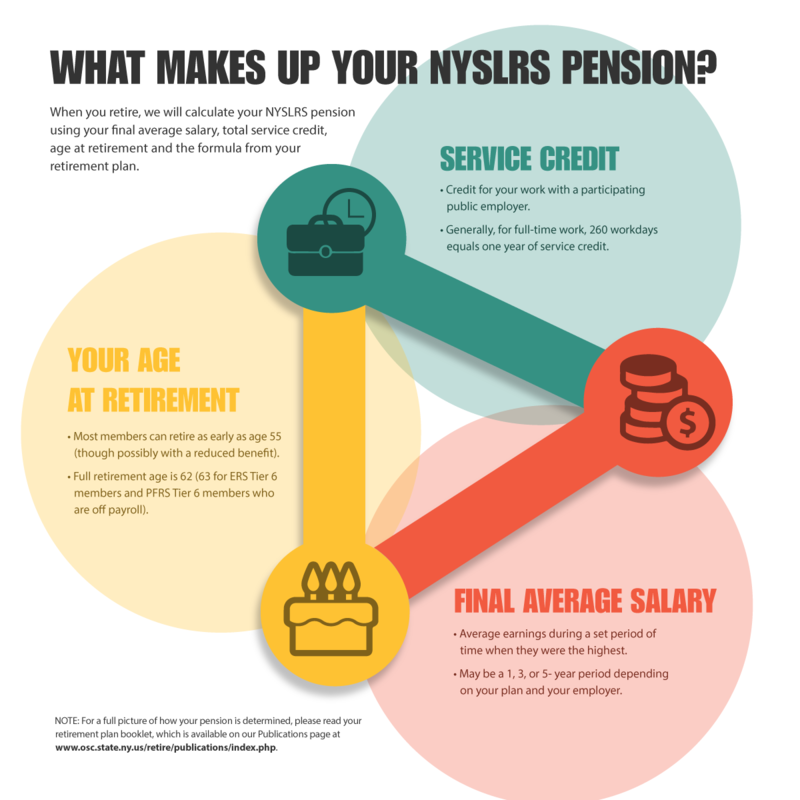 To get account-specific information, you can email our customer service representatives using our secure email form (http://www.emailNYSLRS.com), and one of our representatives will review your account and respond to your questions. Filling out the secure form allows us to safely contact you about your personal account information. That depends on your retirement plan and the date you intend to retire. For the account-specific information you need, please email our customer service representatives using our secure email form and let them know what date of retirement you are considering. One of our representatives will review your account and respond to your questions. Filling out the secure form allows us to safely contact you about your personal account information. Can I transfer my 6 years with NJ pension over to new york? For more information about transferring membership, check out our Transferring or Terminating Your Membership page. Can I work for the same municipality after I retire? 68 Years Of Age, collecting my pension. For information about your specific situation, we recommend emailing our customer service representatives using our secure email form. One of our representatives will review your account and respond to your questions. Filling out the secure form allows us to safely contact you about your personal account information. If you return to public employment, there is generally no restriction on your earnings beginning in the calendar year you turn 65, unless you retired under a disability retirement, or you are returning to a public office. For more information, see our publication, Life Changes: What If I Work After Retirement?. I’m in a union, and I’m wondering if my FAS is based on my three years of salary from Jan. to Dec. of each year?….or is it based on my salary from the contract year? Your final average salary is not limited to a calendar year or a contract year. A three-year FAS is the average of your earnings during any 36 consecutive months of service when they were highest. Usually, this period is the last three years of employment immediately before your retirement date, but it doesn’t have to be. If you have questions about your particular situation, please email our customer service representatives using our secure email form. One of our representatives will review your account and respond to your questions. Filling out the secure form allows us to safely contact you about your personal account information.